It’s hard to say something new or revelatory about a restaurant that’s been plugging away on the edge of Chinatown for over 25 years now, especially when most of the exciting renovations and additions were made before I had even moved to Philadelphia. Perhaps the most impressive thing about Vietnam Restaurant, though, is the fact that it has been around for 25 years, especially in this current era of restaurant flux. In its current incarnation, the perfect time to go is early evening. The large front windows let in the setting sunlight, brightening the entire first-floor dining room and softening the mood. Throw in a couple of Vietnamese “33” lagers and order up a feast from the friendly, patient, and knowledgeable servers. Or, if you want to get silly, grab one of their signature Flaming Volcanoes—a massive mixed drink for two people that includes rum, vodka, gin, brandy, grenadine, Bacardi 151, and fruit juice. As well as a burning flame in the middle of the bowl it’s served in. The cuisine is mostly Vietnamese (as one would assume), but does mix a few other Pacific cultures. My only real complaint is that the spice level can be a bit misrepresented in the menu, as anything listed as “spicy” had a little bit of spice and the dishes listed as “mildly spicy” seemed to have none. Maybe they were toning it down for the newcomers, or maybe it was because I didn’t give them my usual request to make the food Asian-person spicy. Luckily, the food was delicious even without the mouth-numbing spice. 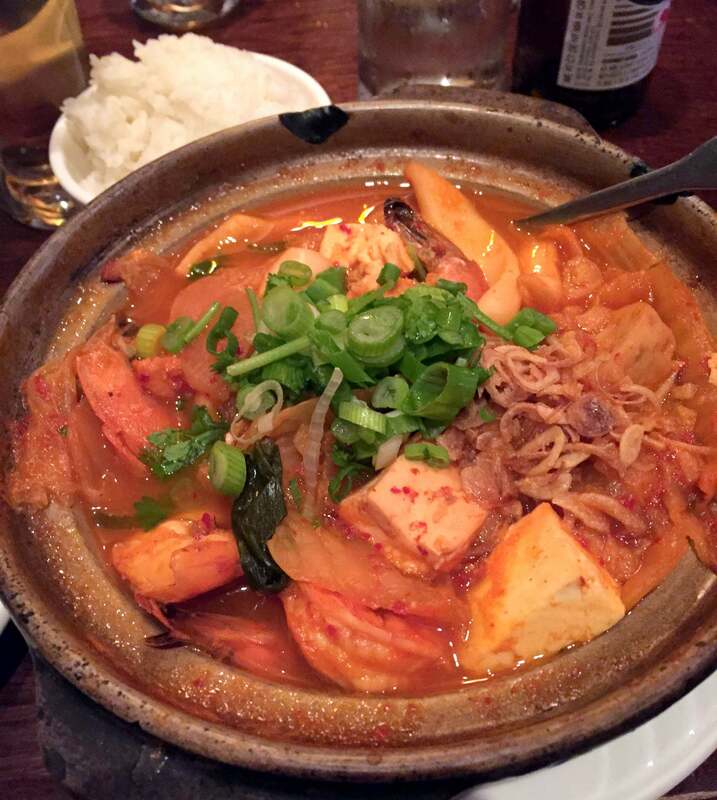 SEAFOOD CLAY POT (Kim Chi Do Bien) – This mildly spicy—and just a bit sour—stew has everything you need for a hearty meal: shrimp, squid, tofu, fish balls, cabbage, and a bowl of rice on the side to add in. It comes out hot, but once the rice cools it down and you go to town, it’s as satisfying as any bowl of pho. BBQ PLATTER – If you want to try pretty much every appetizer they have, this is the way to go. Spring rolls, stuffed grape leaves, grilled chicken, grilled meatballs (that looks more like sausages), rice vermicelli noodles, and lettuce and rice paper to make your own rolls if you want. The huge platter is accompanied by a tangy chili vinegar dressing as well as a peanut hoisin sauce that I now want to bottle and pour over everything. SHRIMP GREEN PAPAYA SALAD (Goi Du Du Tom) – I know it’s not necessarily Vietnamese, but it is one of my favorite dishes of all time, and Vietnam makes it just as good as anyone else. 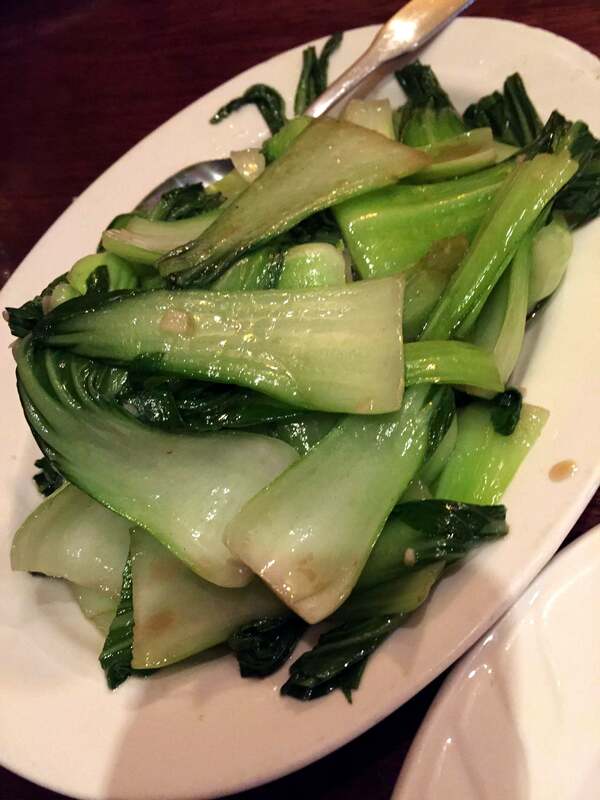 This entry was posted on June 29, 2015 by Ryan in Asian food, Review and tagged asian, bbq, bok choi, clay pot, review, seafood, vietnam, vietnamese.